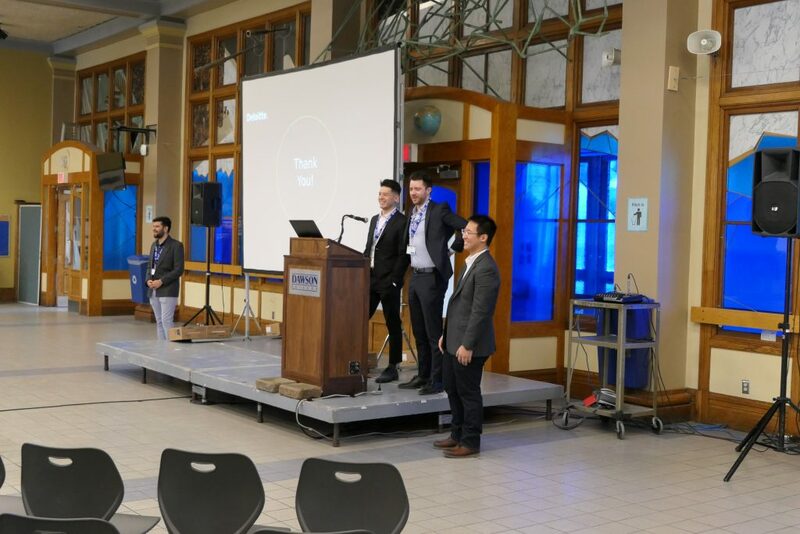 On January 11, 2019 Dawson College held its third annual software conference. Previously called NetBeans Day, this year’s conference was renamed to DawsCon. The final tally of participants was 180. In our first year it was 50 and last year it was 70. 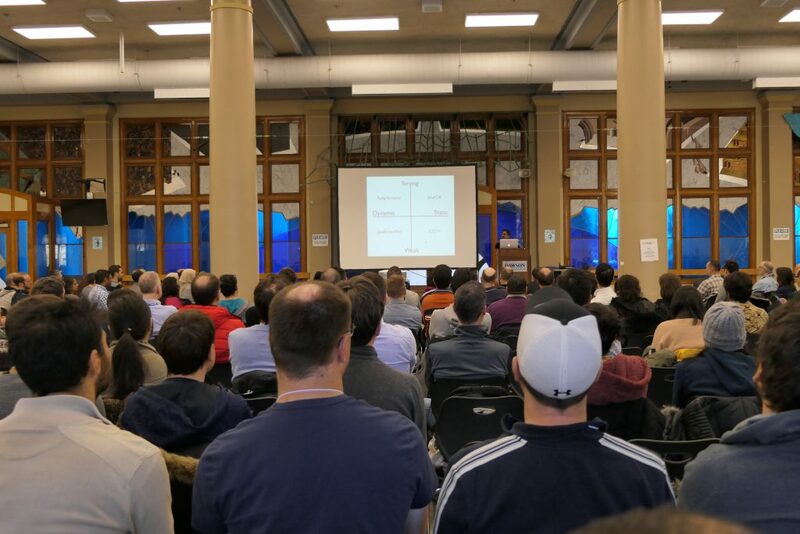 The amazing lineup of speakers and, for the first time, sponsorship from a major organization, Deloitte, elevated the conference beyond just a local event. 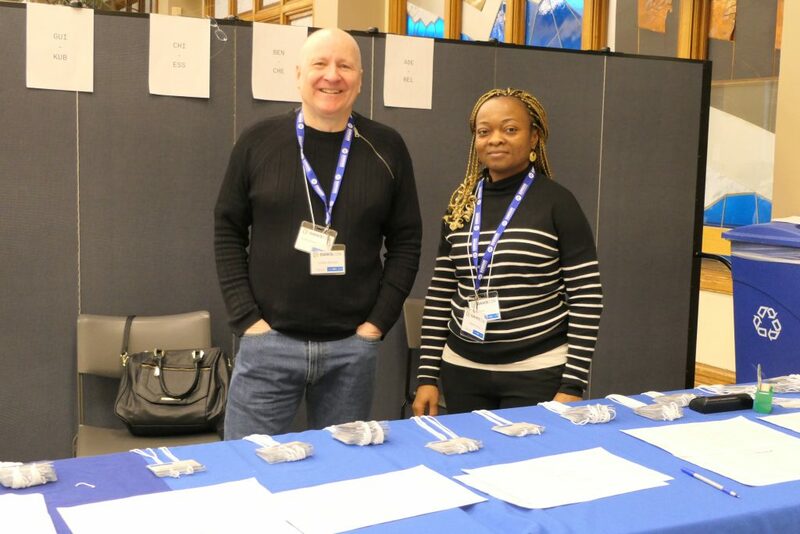 Preparation for this year’s DawsCon began immediately after the 2018 conference. 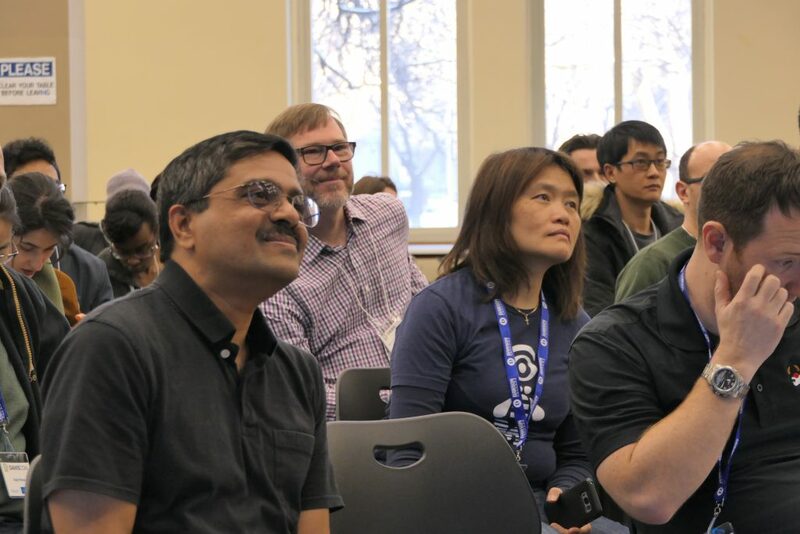 I started tweeting, facebooking, and linkedining to get the word out about the conference. 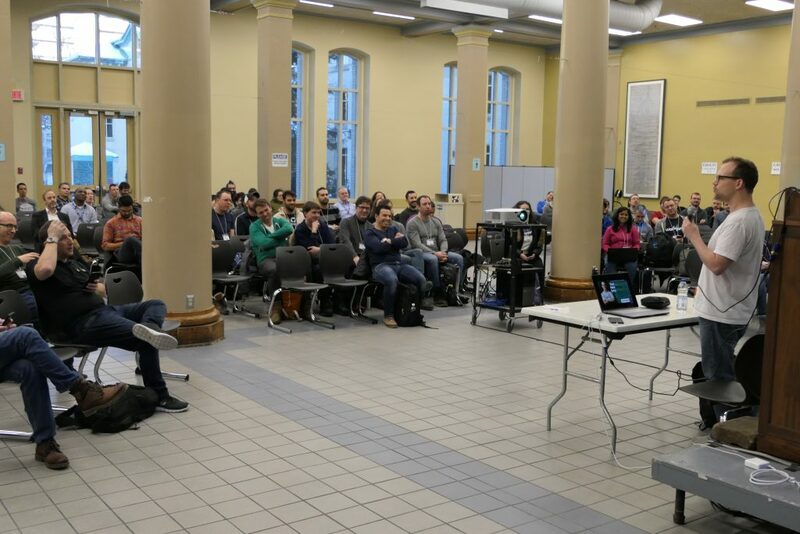 Josh Long, Spring Developer Advocate at Pivotal, Java Champion and resident of San Francisco when he is not travelling, was the first speaker who confirmed for 2019. This came about when he wrote on Twitter how he was looking forward to travelling the world in 2018 promoting Spring. I wrote to him suggesting that we could be his first stop in 2019 and he agreed. Pratik Patel, Lead Developer Advocate at IBM and Java Champion living in Atlanta, was next on my list to reach out to. He spoke at the 2018 conference. Not only did he quickly agree to speak but he brought with him Mary Gryglesk, from Chicago, and Billy Korando, from Kansas City, two developer advocates from IBM to speak as well. 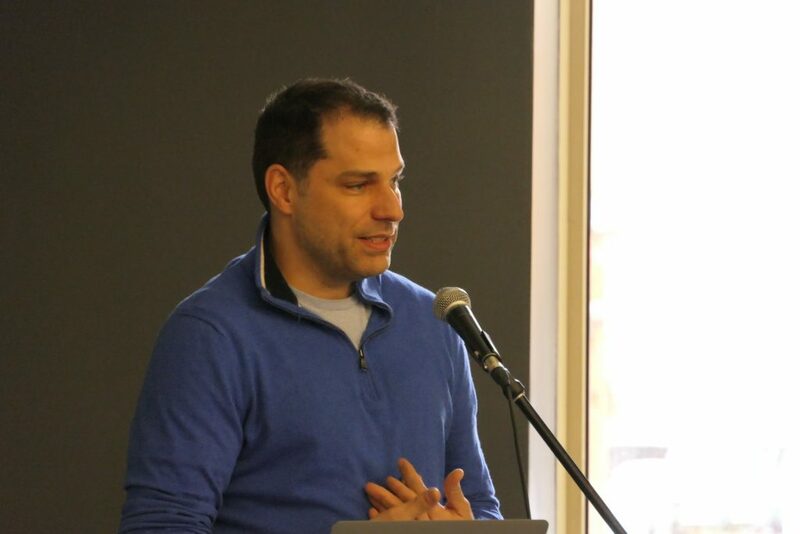 Next, I reached out to Henri Tremblay who had spoken in 2018, a Montreal Java Champion and one of the organizers of the very successful Montreal Java Users Group. Aside from speaking at the event Henri also helped to get the word out for DawsCon to the 2,000+ members of the JUG. 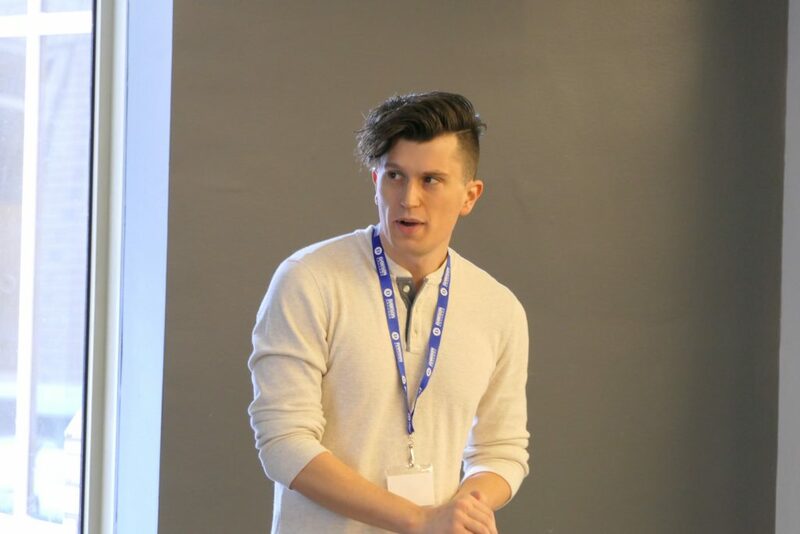 Felix Roberge was another speaker from 2018 and who is now the Chief Technology Officer at D-Teck. I reached out to him and he was more than happy to join us in 2019. Funny thing about both Henri and Felix. Rather than meeting them at some event in Montreal I first met both in San Francisco at Java One. In Henri’s case I sat next to him on a return flight and then discovered that he was in pictures I took at a Google event at Java One. I met Felix while walking back from the appreciation event at Java One when I heard some people speaking French with a Quebec accent. 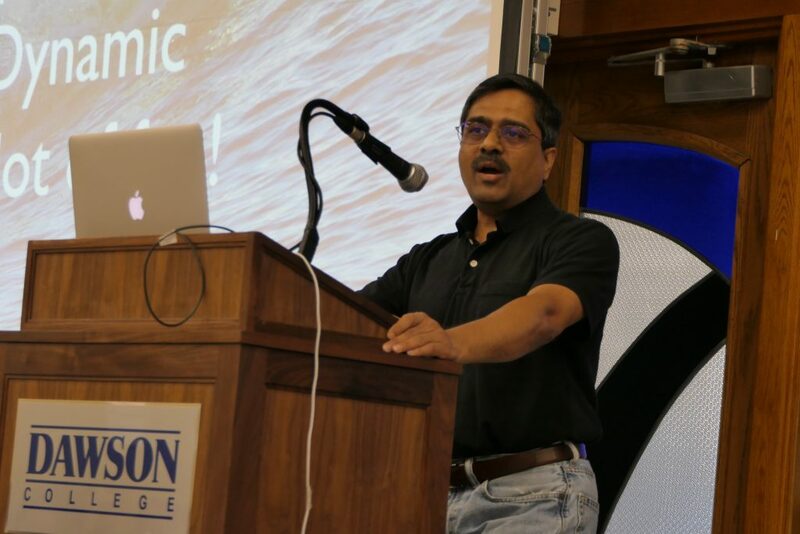 Venkat Subramaniam, President, Agile Developer, Inc., Java Champion and JavaOne Rockstar, is one of the most sought-after speakers in the world. For the 2018 conference Henri learned that he was going to be close by speaking on the east coast of the US. For that conference he was only going to be available for the Thursday and not the Friday the conference was planned for. Due to the lean conference management structure, just me, we moved the conference to the Thursday so he could speak. This year he squeezed us in between Oslo, Boston, Denver and then back to Oslo. We fit in between Boston and Denver. 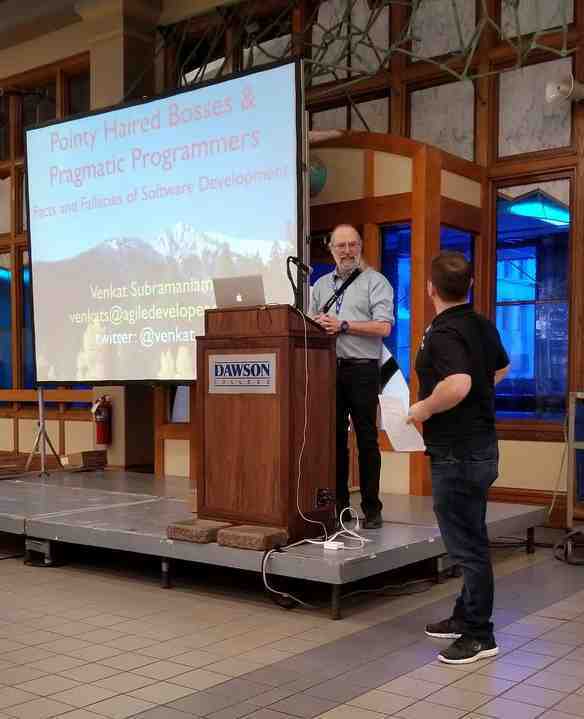 Simon Martinelii, of 72 Services in Switzerland, saw my numerous posts about DawsCon and offered to speak. Simon is an example one of the coolest aspects of the software development profession and that is the desire to share what we know. 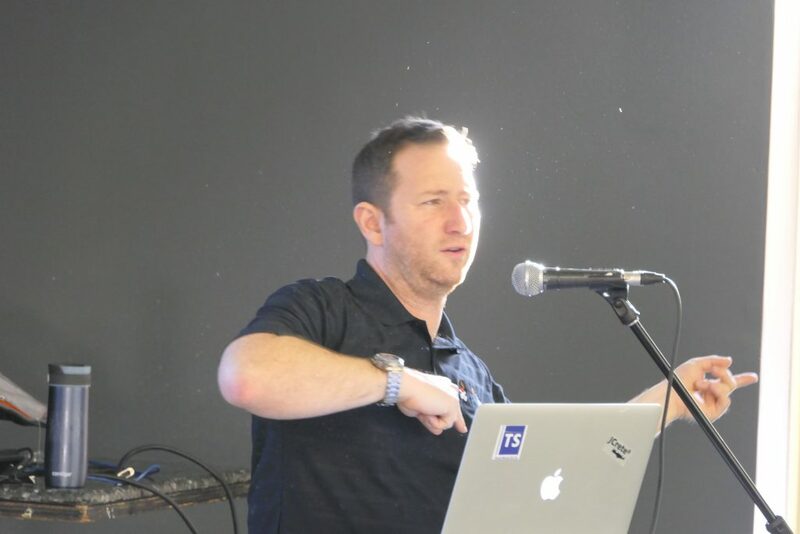 Simon is involved with several JSRs (Java Specification Requests) that drives the evolution of Java. Simon came to Montreal with his wife and my wife and I had the opportunity to spend a little time with them and do a little sightseeing. Initially we were expecting Markus Eisele, another Java Champion, from Lightbend to speak. Unfortunately, due to scheduling issues, he needed to be in Hawaii for LavaCon, he was unable to attend. In his place he arranged to have Hugh McKee, Developer Advocate at Lightbend coming to us from Florida, speak. 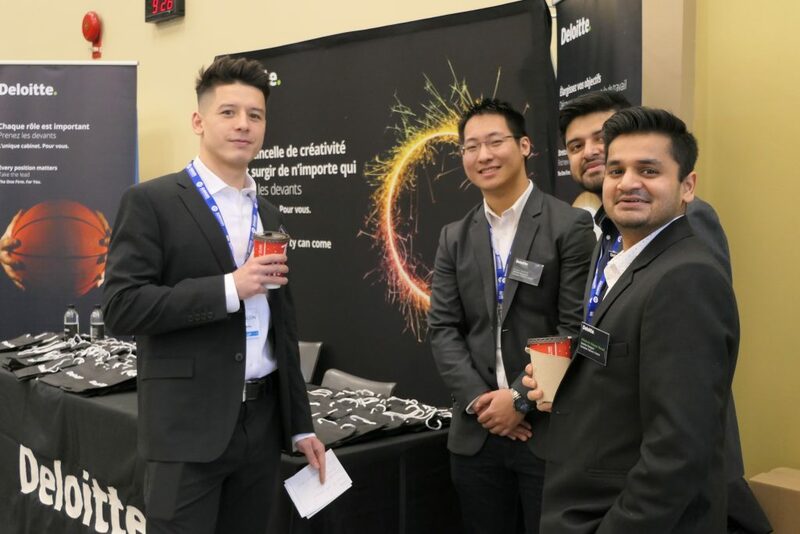 Our final four speakers, Hrishikesh Kanabar, Thomas Winter, Brett Leighton, and Kevin Huang, all came from our first ever sponsor Deloitte here in Montreal. Deloitte is actively growing their software services and these four are part of this growing team. In May I attended an event at Deloitte to encourage us, teachers from Montreal area colleges and universities. to encourage our students to consider working for them. At the last session of the day we were asked what Deloitte could do for us to encourage our students to seek employment with them. I said, semi-seriously, that they could sponsor DawsCon. About two weeks later I was contacted to say that the Deloitte partners had discussed my request and that they will sponsor the conference. 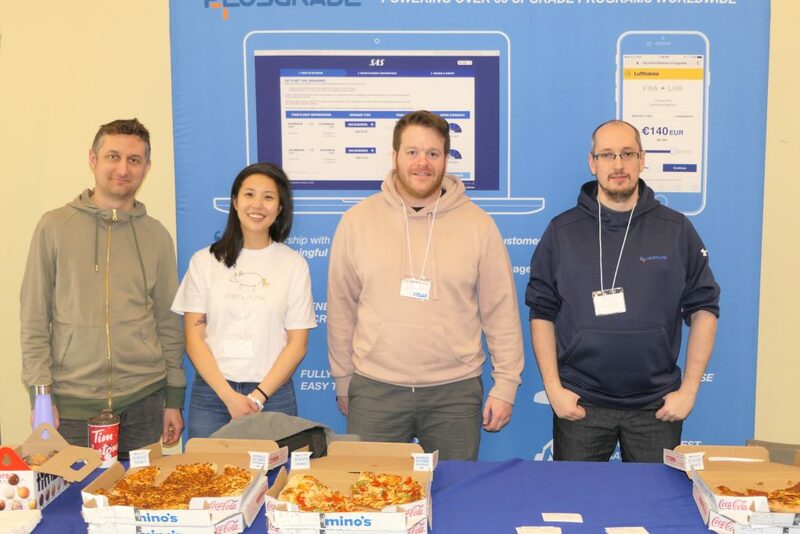 In mid November I was approached by Plusgrade, a software development company here is Montreal, and asked if they could have a booth at the event. Like Deloitte they looked upon DawsCon as a recruiting opportunity. Now we had two sponsors. If you are someone reading this who might be interested in sponsoring next year, then contact me at kfogel@dawsoncollege.qc.ca. There is just 11 ½ months to next year’s DawsCon. Plusgrade and their delightful pizza. 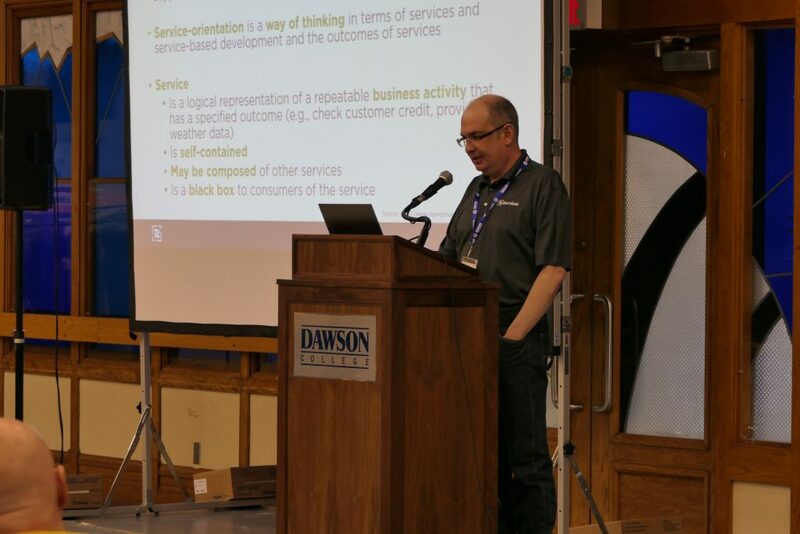 The real first sponsor of DawsCon is Dawson College. 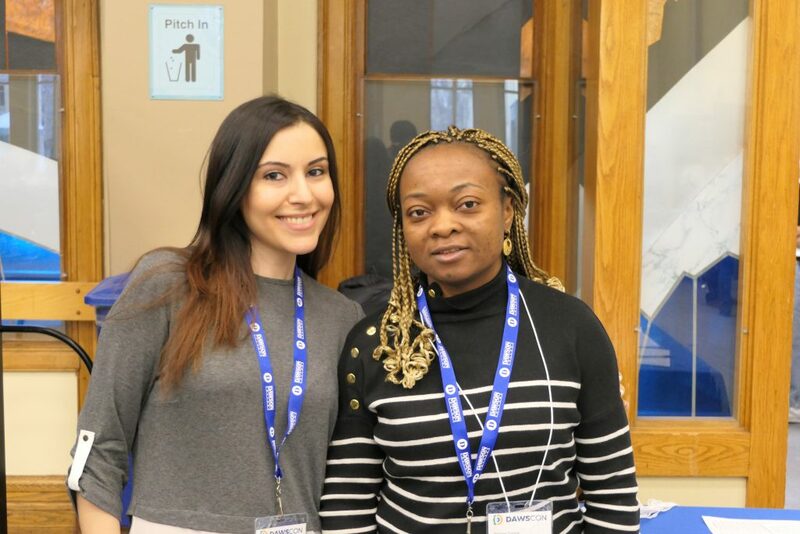 With the support of Diane Gauvin, the Academic Dean, the space for the conference is made available to us at no cost. She made her staff available to assist me in dealing with the bureaucratic tasks necessary to run a conference. Refreshment costs in the first two years were covered by the College while this year’s sponsorship from Deloitte and Plusgrade should cover that expense. This year the college’s public relations department, under the direction of Donna Varrica, arranged to have a logo designed for us and helped us get the message out to the college community. The college’s web group managed our web site and when changes or additions were necessary, they were carried out quickly. Thank you to everyone at Dawson for your help. Its a near full house! 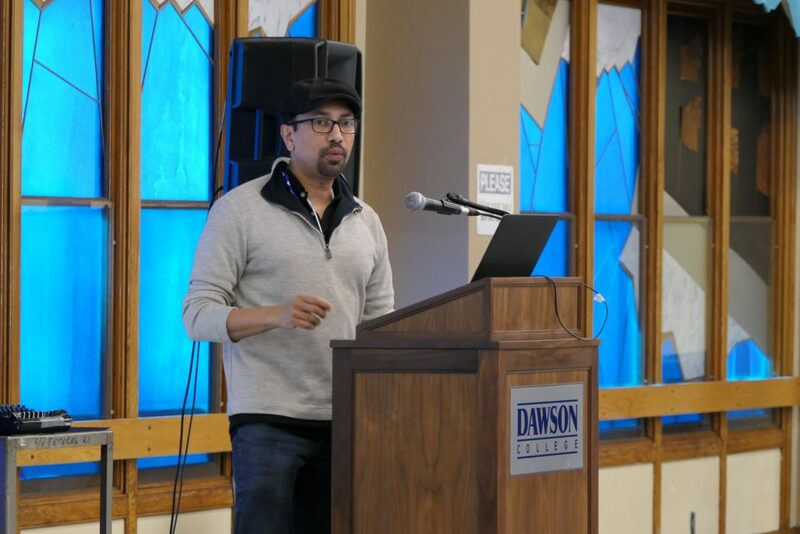 One of the important aspects of DawsCon is to allow Computer Science Technology, the program at Dawson College that I teach in, to reach out to the software development community here in Montreal. 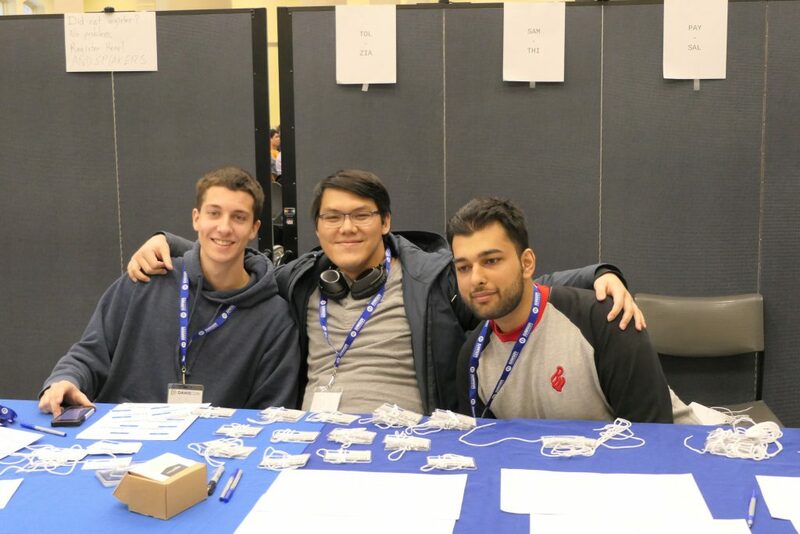 We have an internship in the final semester of our three-year program and our internship coordinator made several important contacts at the conference. Some of our student volunteers. In the end the conference went off without a hitch. We held a keynote at the start of the day and one at the end. Between the keynotes we had two sessions running each hour. The only tiny issue was video adapters. While I have adaptors for mini and maxi display ports, this year’s crop of laptops wanted a USB-C adaptor while all our projectors used VGA connectors. Luckily the speakers from IBM came equipped with all the necessary adaptors. I do remember seeing at one session a three-adaptor chain to get a laptop’s output to VGA. By the end of the day my step counter read 22,320 steps. I’d like to thank my faculty and student volunteers. Without their help the day would not have been successful. I’d like to thank the Plant & Facilities department of the college whose staff set up the rooms we used perfectly. Even when, on Thursday morning, I noticed that the cafeteria setup was too much to one side the P & F staff were happy to move the stage and every chair about 3 meters to the left. 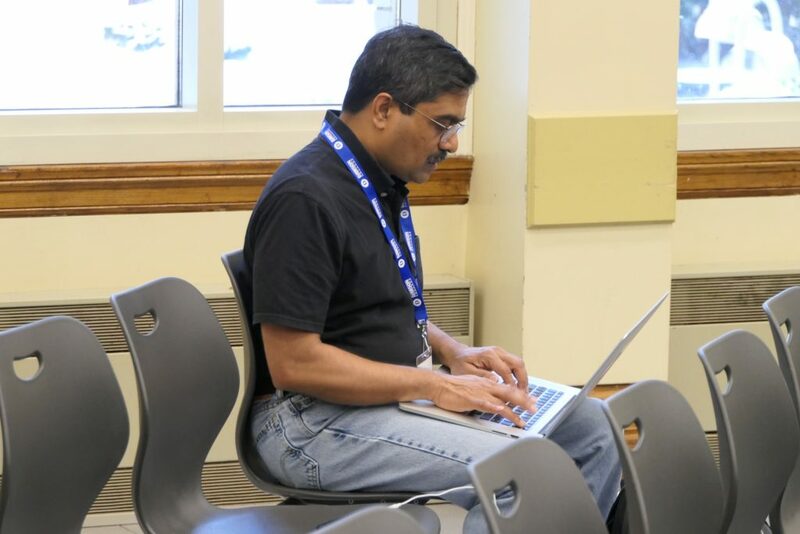 The secret to Venkat’s success, he is always working. 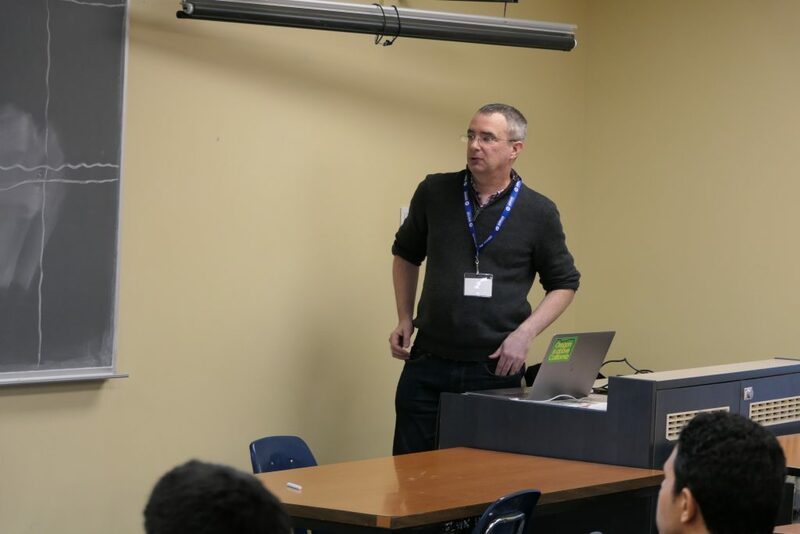 I started DawsCon to bring a little of Java One to my students and the Montreal software community. 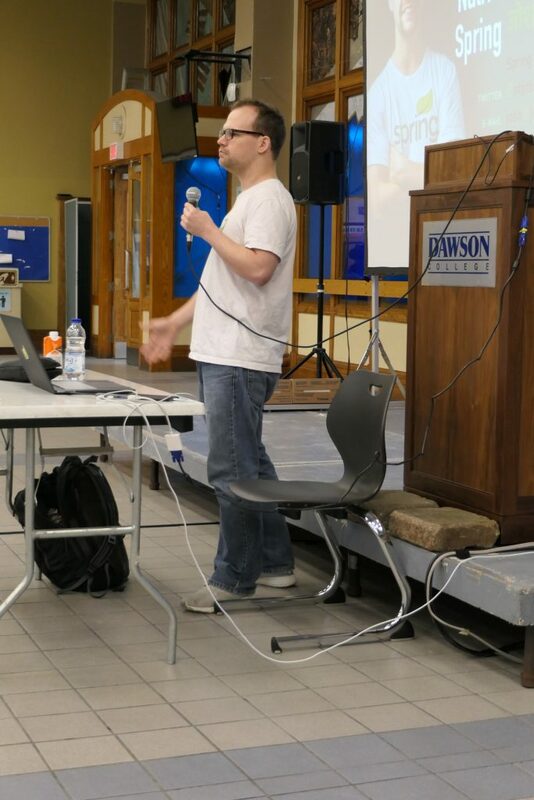 I have been fortunate to attend Java One, now called Code One, every year since 2014 with funding support from Concordia University, where I teach part time, and from Dawson College, my full-time gig. I have spoken at that conference every year that I have attended. 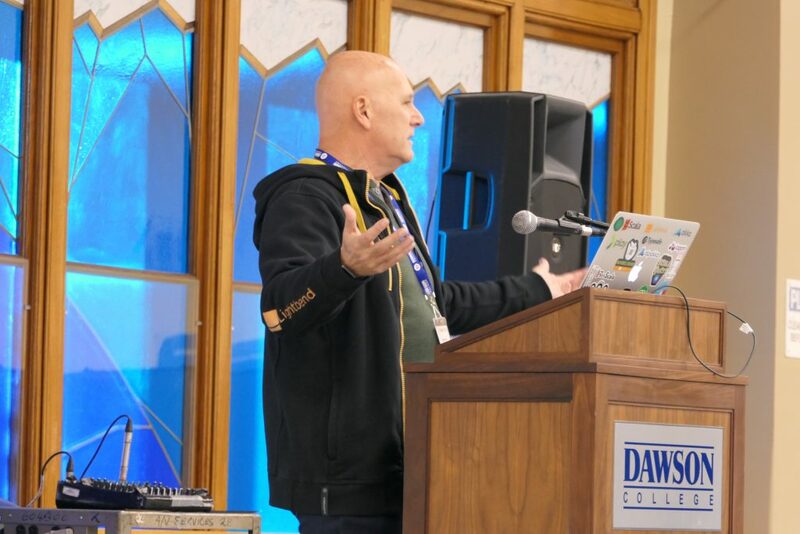 Unlike JavaOne/CodeOne and most other conferences, with Dawson College’s support the DawsCon conference remains free to attend. Don’t forget, DawsCon returns January 10, 2020. By the time I attended Code One last October I had already found all the speakers and had to put some on the list for 2020. 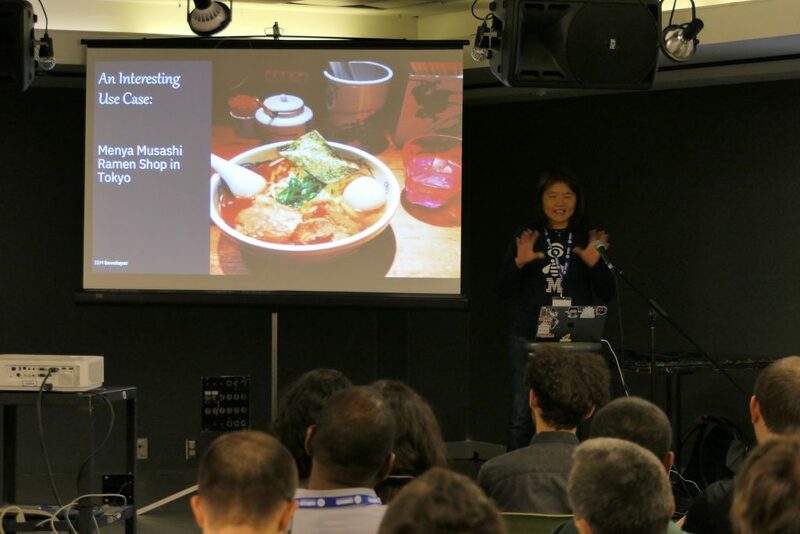 If you are interested in speaking at a conference aimed at students and developers, then let me know. Henri interrupting me while I was introducing Venkat. I also discovered that I had been accepted into the Java Champions program back in December but Henri arranged to have it only announced at DawsCon. My swollen head is slowly shrinking to normal but I remain humbled to part of a group of developers I have been in awe of from when I first started coding and teaching Java. The Dawson College cafeteria full of eager conference goers. DawsCon 2019 was excellent, Ken. Cheers! Thank you so much again, Ken! It was a great conference. I will definitely return if I can regardless of the weather outside.